TomKat split. In case you didn’t know. I don’t know why you wouldn’t know, because apparently it is so important that it became the NATIONAL NEWS!!! Hello, is it just me or do we really need to hear about celebrities’ divorce on the evening news? ET is made for it. So is Twitter and Facebook. It was all cute when Katie and Tom got together, had their fairytale wedding and were nicknamed the “perfect couple”. I admit, I hoped that it would work. More for her, than for him. It was her dream of dreams to marry him and I hoped she would get what she wanted. Just like I did.But my Hubby told me, like he always does, that it won’t last and he gives them two, OK, three years tops. Ohhh, I was hoping he would be wrong this time. Nope. He was right, just like he always is. My face-the-reality guy. Eh, forget the celebrities. They will move on, she will move on just like Nicole did and look at her now! Happy as a clam! But you won’t move on. Not until you make this. Carrot cake lovers unite! Unite over a slow cooker. Because when the oven is not an option ( especially when outdoors feels like you could bake and fry on the sidewalk ) – your crock pot or slow cooker is there for you. “But, Anna, slow cooker cakes are never preeeeetty!!”. I hear you! Enter little itty bitty jar. Sprinkles make anything look pretty and happy. 🙂 Instant beauty. Do I even have to say how good this cake is? Didn’t think so. Just make it. Line the bottom of your slow cooker with a aluminum foil so it comes up about 1 to 2 inches up the sides. Butter the foil or spray with cooking oil. In a medium mixing bowl, whisk together the dry ingredients ( flour, sugar, spices, baking powder, soda and salt ). In a small bowl, whisk together the wet ingredients ( water, oil and eggs ). Add the wet ingredients to dry ingredients and beat until smooth, 2 to 3 minutes. Stir in carrots and coconut. Spread the batter in your slow cooker. Cover and cook on high 2 to 2,5 hours. Check the cake after 1 3/4 hour with a toothpick. My cake was done around the 2 hour mark. If the toothpick comes out clean – your cake is done. Let it cool for 5 minutes in the slow cooker with lid off. Lift the cake out and cool completely on a cooling rack. 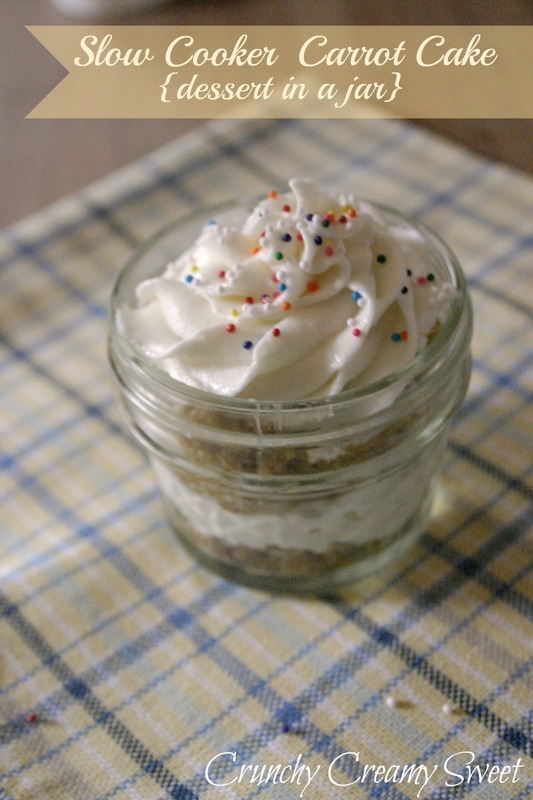 WHen your cake is completely cool, use your jar as a template and cut circles of cake out with a sharp knife. Slice each circle in half, as you would for a layer cake. Place the bottom half on the bottom of your jar. You can crumble the cake and sprinkle it onto the bottom of your jar and then gently press down. With the frosting in your piping bag, cover the cake layer with the frosting. Place the top layer of your cake on the layer of frosting. Now be creative and make a pretty swirl of frosting on the top layer of your cake. Add sprinkles. Repeat for every jar. Crumble the scraps of your cake and fill the jars as suggested above. In a large mixing bowl of a stand mixer, beat together butter and cream cheese until smooth. Add vanilla and beat again. Slowly add powdered sugar, 1/2 cup at a time, until you reach the desired consistency. Tomorrow… oh, tomorrow.. 🙂 It will be very special. Hope to see you here! Oh my gosh, I have never heard of a slow-cooker-cake!! That's wild. Good going, looks so cute and totally ideal in this heat! This is so adorable! Who doesn't love carrot cake, and especially in their own individual serving?! Love the sprinkles on top, so cute! What a pretty photo!!! 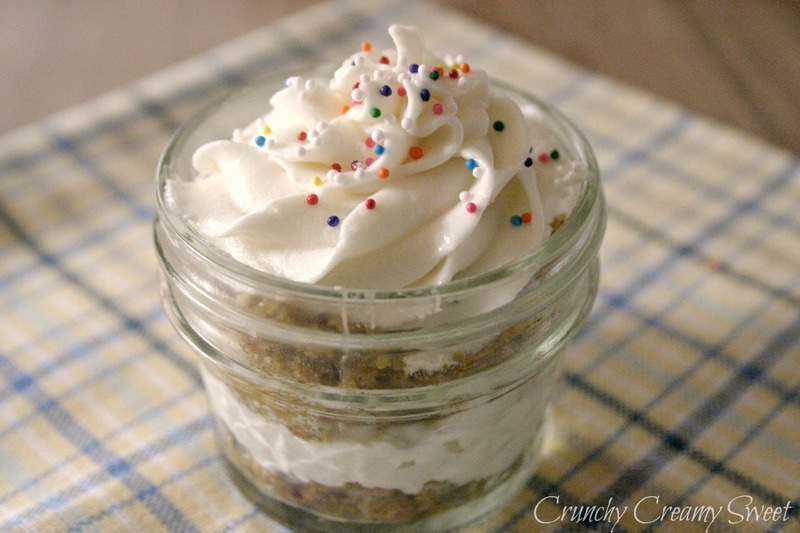 Any dessert in a jar sounds delicious! I need me some cute little jars like these. Then I need me some pretty little cakes like these. Two words: Hobby Lobby. 🙂 Thanks, Nisha! What a great idea! Individual desserts are the best! Love it! Right? 🙂 Thank you, Jessica! This is my husbands favorite kind of cake and I love making it in all kinds of versions. 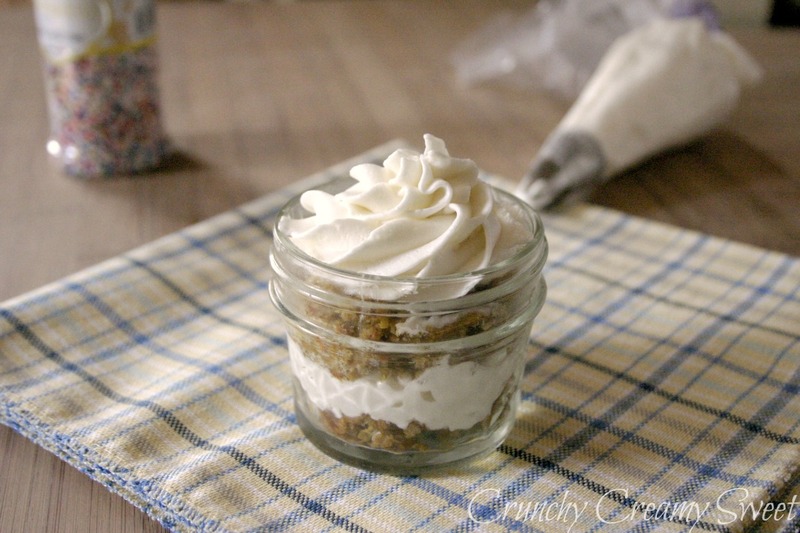 What a cute recipe in these sweet jars! Yay! Thank you, Cathy! I am so happy you like it! I agree. I don't think it was National News worthy, but this is what the world has come to. I love that you made a cake in the crockpot. These little gems look delicious. I looooove carrot cake and single servings anytime too. This is very creative..and adorable – thanks so much for sharing. You are very welcome:) Thank you for stopping by! This is so unique and so pretty in those jars! It is a definite must try, plus such a great Pin. I hope you will give it a try, Anne! Thank you! So let's outsmart the Nature and bake in slow cookers!! lol 🙂 Thanks, Dorothy! Aww, thank you so much, sweet Patty! These are adorable! I can't believe you baked them in a crock pot, because they are so elegant in the little jars! This would be cute for a party! Thanks for visiting today and I'm really glad you like the cobbler. It's exciting for me to share the recipe! This is pretty awesome. Who new… cake in a crock pot! Oh my, you have really outdone yourself here. This looks so GOOD! Aww, you are so sweet 🙂 Thank you so much, Ellen!